Two very tiny, three miute rim chips, surface very near perfect. 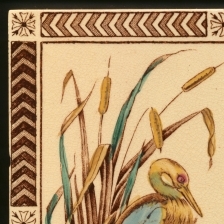 A superb aesthetic movement nature study design with naturalistic heron and kingfisher, butterfly and fish, bullrushes and water lilies. Quite an amazing tile for this less-than leading company which perfectly encapsulates the essence of the style. 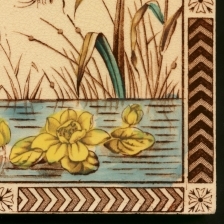 The only mass produced tile with such eclectic pond-life decoration, mass-produced being printed but rarely found, similar designs found on studio tile panels and in other media such as stained glass and other painted wares. An evocative example of the style, rarely found on tiles and a wnderful addition to any collection of Aesthetic Movement designs. Stubbs & Hodgart are little known of, the company mainly produced transfer printed designs but also some stencilled and slip decorated. 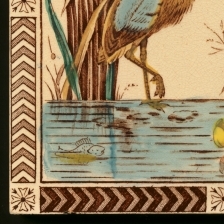 The catalogue sheet shown in Lockett is rather misleading for it shows embossed tiles made by Boote, Stubbs & Hodgart was a distributor for Boote and were one of many companies who decorated Boote's blanks so its wares are mostly difficult to identify. 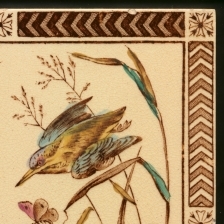 This design appears in The Decorated Tile by J & B Austwick, it was thirty years or so after seeing the book that I actually found an example, where it is described as Crystal Porcelain Pottery Co c.1885. It seems likely that CPP either used designs by other companies or other companies used their blanks when porcelain body was required for several designs by Steele & Wood are also found on CPP blanks. Being by S&H rather than CPP makes the rarity less understandable apart from the date, had it been introduced a decade earlier it would surely have been much more popular but by 1899 the aesthetic movement style was past its peak. Verso clean but latex adhesive residue, Boote ring grip pattern, printed design registration number.